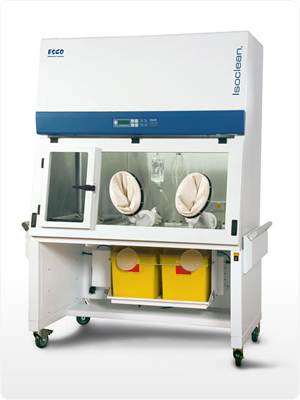 The negative pressure, recirculating isolator is suitable for work involving hazardous materials, antineoplastic, or cytotoxic compounding applications. The work zone and pass-thru interchange are under negative pressure to the room in order to maintain operator protection in case of a breach in the barrier isolation system. When hazardous drugs compounded have the potential to volatilize, the negative pressure, recirculating isolator should be ordered with the optional exhaust activated carbon filter and / or externally vented. Streamline® Pharmacy Compounding Aseptic Containment Isolator, provides a safe and clean environment for compounding of hazardous, sterile drug preparations in compliance with USP 797* criteria. * United States Pharmacopoeia (USP), Chapter 797(1), enacted January 1, 2004, presents the first enforceable standards for sterile compounding. Following years of patient safety recommendations and professional guidelines, the intent of USP 797 is to set forth the procedural and practical requirements for safe compounding of sterile preparations. The Chapter’s requirements are applicable in all practice settings where sterile preparations are compounded. Main Chamber Work Zone (WxDxH) 33.1" x 24" x 26.4" 57.1" x 24" x 26.4"
Pass Through (WxDxH) 13.9" x 24" x 26.4" 13.9" x 24" x 26.4"